These are all stores that I love. Ironically, these stores do not exist in Manhattan. Yes we have districts for fabric, flowers and trim, but sometimes its nice to go into ONE store that has all of these things. On the search for bed skirt fabric, I ran across this store. Tinsel Trading Company. Had a shabby chic meets elements of style vibe. The walls and walls of RIBBON. 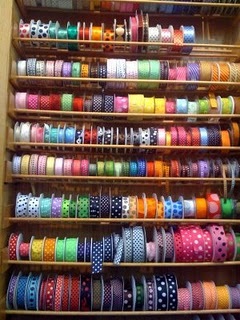 Maybe I'm just slow, but it has taken me almost 2 years to find a place that sells more than 10 spools of ribbon. Know what else? Martha says its her favorite store in all the world!